Are inflatable Stand Up Paddleboards durable? Yes they are. Inflatable SUPs are made with a tough “drop stitch” material which makes them incredibly durable. This technology also enables inflatable SUPs to be inflated to an impressive 15 pounds per square inch (PSI), which makes them surprisingly very rigid (almost as rigid as a hard board). How long do they take to pump up? Most inflatable SUPs I’ve tried take about 5 minutes to pump up (and I must say, it’s 5 minutes of intense pumping). It can be a bit difficult, but hey, it’s a good way to get your heart rate up before you hit the water. Are they tippy? And do inflatable SUPs handle differently than a hard board? Inflatable SUPs will feel different than a hard board. Unless you have a really wide inflatable SUP (ie. one designed specifically for yoga), then an inflatable SUP will likely be a little less stable than a hard board. If you want a board that you can SUP surf or manage well in rough waters, a hardboard may be a better choice. However, if you’re looking for a board that will handle well in flat water as well as a little rougher water, an inflatable will be just fine. Where can I buy an inflatable SUP? Inflatable SUPs are becoming increasingly popular, which means most companies that sell hardboards will typically have one or two inflatable models in stock. 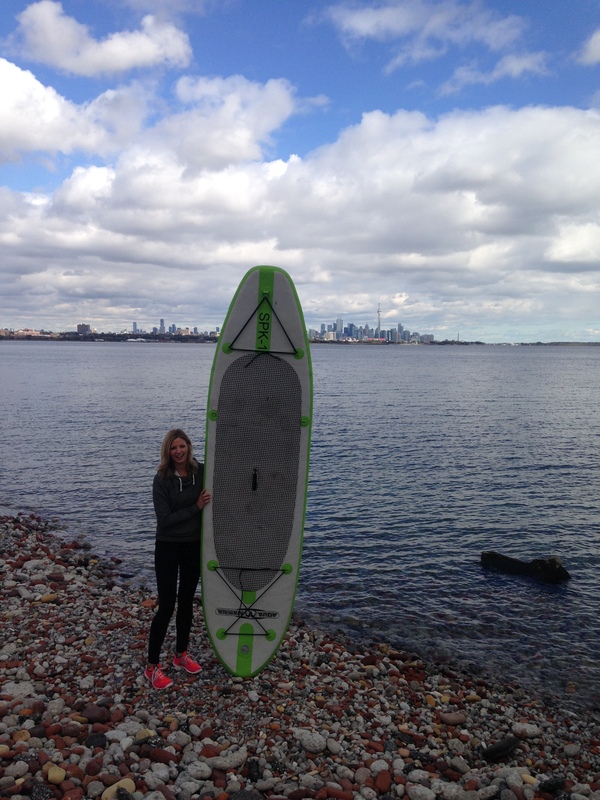 My friend Katie was able to pick up an amazing inflatable SUP from Mountain Equipment Co-op at the end of this season for around $650 – which came with a high quality pump, lots of extra fins and a backpack for easy transport. But you don’t need to head to a specialty surf or paddle shop…you can get a surprisingly decent inflatable board at places like Costco and Canadian Tire too. Like hard boards, inflatable SUPs range greatly in price. Inflatable SUPs start at around $600 for a decent, entry level board and can go for as much as $1500+ for a higher quality, performance board. Keep a look out for end of season sales. Many shops close up for the fall/winter season and they often do a big sell-off of their old SUPs at the end of the season. Also – check out used boards on Kijiji or other classified sites for great deals. Posted on October 17, 2015 November 2, 2015 by paddlewagonPosted in equipment, inflatableTagged inflatable, sup.